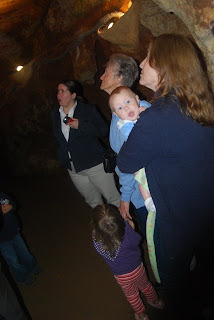 An impromptu trip to Syline Caverns 2 weeks ago was a lot of fun. 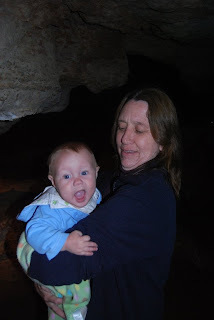 Matthew discovered a love for caves. 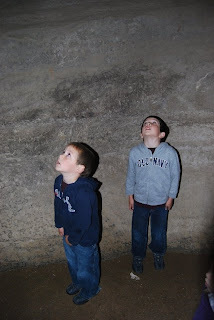 As the tour guide was talking about geologists working in the caves Matthew turned to me and said, "I want to do that when I grow up." I smiled and said "Oh, you want to be a geologist?" "No, I want to be a tour guide." The kids were very well behaved, much to my mother's amazement I'm sure. 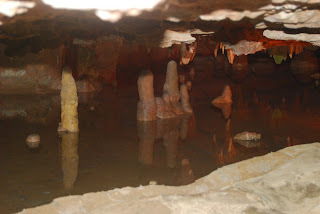 They only touched the one formation in the cave that you're allowed to touch. Matthew only tried to take over leading the tour a few times. He is such a little know-it-all! 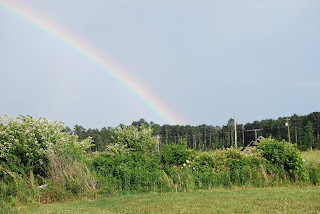 OK, this would be a random picture of a rainbow that we saw in North Carolina on the day we drove up to Virginia. Not sure how that got stuck in here but it's pretty so I'll leave it. My mom held Nathan for a bit while I nursed Ryan in the Mei Tai. Yes, I nurse everywhere, even underground! These boys were just in awe of God's creations. 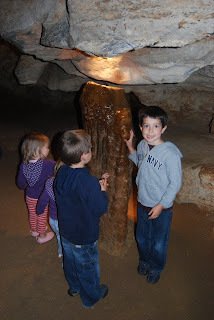 The cave was so much fun for them and it reminded me of all the field trips I took there as a child myself.